Emerging consumers have a growing appetite for major global brands. Among the winners to date are fashion labels such as Zara or H&M, but also the electronic giants Apple and Samsung. Mobility and connectivity are the two themes at the top of emerging consumers' spending intentions, according to Credit Suisse's Emerging Consumer Survey. Nearly 16,000 consumers in nine emerging markets around the globe were surveyed in this study. The spending momentum intentions, which compare spending intentions in 2015 versus 2014, are up more than 9 percent for cars and nearly 7 percent with regard to holidays. Concerning connectivity, around 8 percent of the respondents intend to spend more on Internet access and smartphones. It is worth noting that the spending momentum is negative with regard to notebook PCs, basic mobile phones and desktop computers. At an overall level, emerging consumers continue to show a strong preference for domestic brands across all income levels, with the exception of Russia and Saudi Arabia. In terms of affordability, domestic preferences are heavily skewed towards consumer staples. For more expensive discretionary items such as clothing, shoes, sportswear, jewelry and perfume, the aspiration to buy foreign branded goods rose to 56 percent in the 2015 survey from 51 percent in the 2013 survey, mirrored by a drop in planned domestic brand buying to 19 percent for these products from 35 percent. The category benefiting most from a rise in spending intentions for Western brands was fashion apparel or clothes, where spending intentions rose to 54 percent in 2015 from 47 percent the previous year. The only item where the emerging consumers prefer a local brand when it comes to more expensive goods is jewelry. In both China and Saudi Arabia, the domestic share for jewelry exceeds 70 percent. 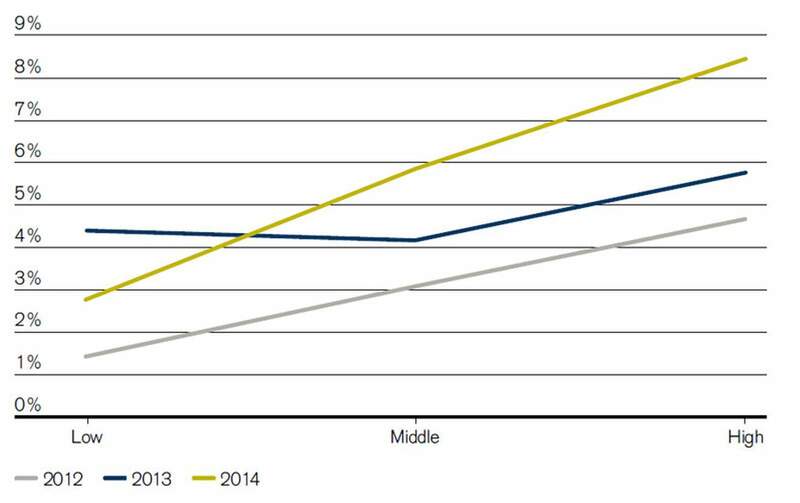 Another interesting trend is that local brand loyalty generally decreases as income levels rise. In Brazil, for example, there is marked switch among higher income respondents to a preference for international brands, while this occurs at medium income levels in Russia. This may partially be explained by the lack of domestic Russian heritage brands and products. In Saudi Arabia, all income levels prefer Western brands. 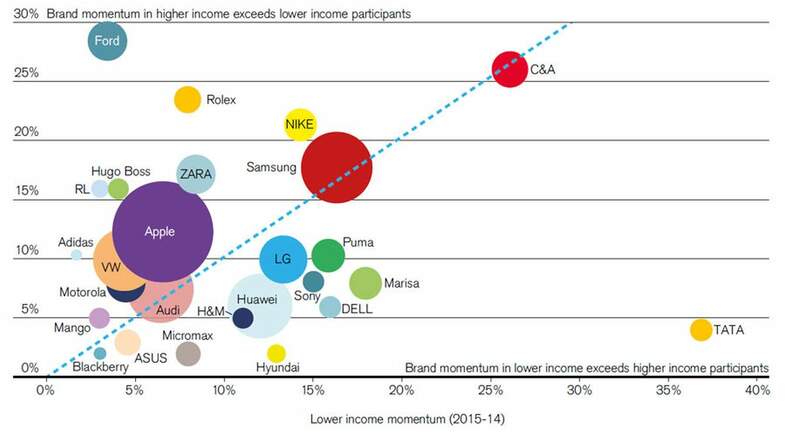 Brands such as Samsung, Zara and H&M screen well among both lower- and higher-income emerging consumers' spending intentions (see adjacent figure). It is worth highlighting that the South Korean electronics giant Samsung comes out first in 23 out of the 27 technology purchasing segments across the nine countries surveyed, while the Chinese technology company Huawei and the Indian low-cost smartphone producer Micromax both gain spending momentum. The Dutch clothes retailer C&A also scores well in terms of spending momentum. The overall picture would not be complete without a mention of Apple, which again shows a steady improvement in spending momentum. The large size of the bubble in the adjacent figure reflects the brand's broad penetration in the largest emerging markets, notably in China. The Chinese smartphone maker Xiaomi still has not made it into the brands with most spending momentum, despite a 32 percent rise in smartphone unit sales during the course of 2014. China, which has been a growing market for luxury products for years, is no longer the key market for numerous premium brands. This is due to several reasons: Asia's economic slowdown, of which China is the key market, falling property prices, the street protests in Hong Kong, as well as the ongoing crackdown on corruption in China that has curtailed the practice of present giving, reducing the local trading environment further. But it is not only the weaker economic environment that is behind the declining Chinese interest in Western luxury brands. There is also a discernable shift toward affordable luxury and high street brands among Chinese consumers. This trend is the result of the changing tastes of some luxury good consumers, a rising share of female wealth, as well as a higher number of the Millennial generation in the customer mix. This stronger demand for high street fashion is captured by middle market and value brands that have expanded their store rollouts and distribution channels across China. Spain's Inditex – behind the Zara and Massimo Dutti brands – for instance increased the number of its Chinese stores by 220 percent between 2011 and 2014. Emerging markets now account for 40 percent of Zara's stores and 21 percent of Sweden's H&M stores. As the survey shows (see adjacent figure), there is a clear correlation between international high street brand penetration in purchasing intentions and the brands' increased store rollout. This trend is seen across all emerging markets surveyed, except India, where purchasing intentions focus on jeans, and in Indonesia. The 20 percent drop in Indonesia's currency against the US dollar during the course of 2013 could explain the declining interest in high street brands. On January 23rd, Credit Suisse presented its fifth annual Emerging Consumer Survey at the World Economic Forum in Davos, Switzerland. The detailed study, which is published by the Credit Suisse Research Institute, profiles consumer sentiment and its drivers across the emerging world. To undertake the project, Credit Suisse has again partnered with global market research firm Nielsen to conduct nearly 16,000 face-to-face interviews with consumers across nine economies. These include: Brazil, China, India, Indonesia, Mexico, Russia, Saudi Arabia, Turkey and South Africa. The research is unique in benchmarking consumer behavior across these countries in a consistent and detailed manner; posing approximately 100 questions to help establish a detailed profile of consumers' spending habits, future intentions, and the factors that influence them.